"Pegasus Prune" roadside tree cutting at Powys and Shropshire. 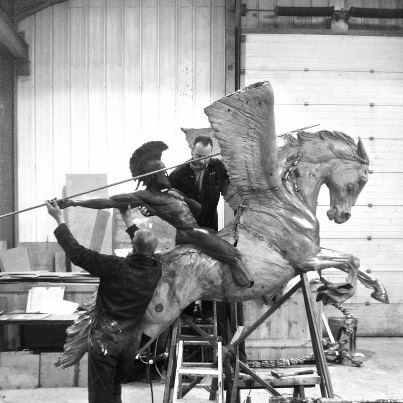 A huge Pegasus with Belephron riding proud has been sculptured by Mark Jackson of Jacko Art and Charlie Langton then cast at Castle Fine Arts Foundry at Llanrhaeadr ym Mochnant above Bala. It will be moved slowly and carefully in 2 weeks via road to the National Memorial Arboretum at Staffordshire where it will take pride of place in a dedicated Parachute Regiment and Airborne Forces remembrance plot.